In Isle of Man, the number of people called Three Legs (3 Legs) is increasing, but the official name is TRISKELE (Triskyle). Although the true origin of this ancient motif is not clear, it is thought that it was brought about after Alexander III of Scotland dominated the territory of Manx in 1265. It is thought that Alexander would have adopted three legs, a symbol of the sun a few hundred years ago, that dates back then. 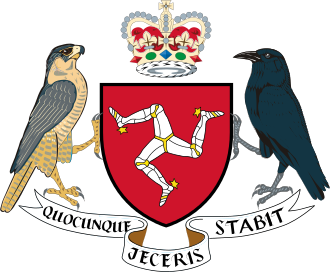 In the crest of Isle of Man, there are the characters "QUOCUNQUE" "JECERIS" "STABIT" under Triskiel (It is also listed in bank notes). It seems not to be English in any way! I thought. And the meaning means "Whichever way you through I stand". So it seems that these three words mean in this order, "Whichever way you thorough I stand”". "JECERIS" has the meaning of "Viking Grave" (tomb of Viking). "QUOCUNQUE" refers to "Legend" (legend / myth). Furthermore, it seems that there is another meaning in these three words (hidden), its meaning is Three legs on arms and then told me that it is untied security from thence. If you unite with three legs on your arms, you will get unlimited safety that is not bound. That means that there is a hidden meaning. Perhaps you put three legs on your arms and it might be referring to something like an emblem / armband. The three arms armed with self-defense are unified at the center and the safety is guaranteed. This is probably a meaning to represent the state rebuilding of the Isle of Man. There is a metaphor, but I think that it is better to recognize which one to choice is individual freedom, and that any one is correct.